The rumours had been sweeping the press for a quarter of an hour before President Bush stepped up to the podium to respond to his party's election defeat: His defence secretary, Donald Rumsfeld, was on the way out. As the news conference began there were indications that there was truth to the gossip. Mr Rumsfeld - unusually - was not at the press conference. Mr Bush was there, of course, but he looked as if he would rather not be. He joked with the press corps, a regular habit of his - but one which reveals his nervousness, not his confidence. The swagger that so often characterises the president was gone as he admitted the Republicans had received a "thumping" at the polls on Tuesday. He began trying to back off from his own comment almost as soon as it slipped out of his mouth, insisting that nationwide, the results had been close, although the electoral system had skewed the results towards the Democrats. He did not mention that the same could be said of the previous three Congressional elections where he led the Republican ticket - or even more so of his own bitterly fought election victory in 2000. But he did hark back to that long-ago year with a comment about how he had worked with both Republicans and Democrats as governor of Texas. He seems already to be offering olive branches to the former opposition as it prepares to take up some of the reins of power. 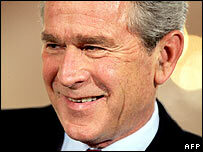 But other than a few references to his bipartisan past, Mr Bush refused to look back, especially to Tuesday. "If you had any do-overs to do in this race..."
Mr Bush cut him off: "You don't get to do them." The reporter tried again, rephrasing the question so it was about the president's chief campaign strategist. "Or if Mr Rove had any do-overs to do in this race..."
The president stopped him again: "You don't get do-overs." But he did then make an effort to answer the question - a rambling reply mentioning several different races - before he returned to where he began. "As far as do-overs ...." he trailed off, looked down, paused, and gestured to his advisers.